At a maximum length of 10.7m, the minke whale (Balaenoptera acutorostrata) is the smallest member of the rorqual whale family of baleen (filter-feeding) whales. It has a sharply pointed snout, slender streamlined body, and a tall falcate dorsal fin positioned slightly less that two thirds of the way back from the tip of the rostrum (as in Sei whales). The back of the minke is black, brown or dark grey in colour, whereas the belly and underside of the flippers are usually white. The most conspicuous feature for identification is a diagonal white band on the upper surface of each flipper (see photo right), the extent and orientation of which varies from individual to individual. As in fin whales, minke whales sometimes also have a light chevron behind the head and two regions of light grey on each side (one just above and behind the flipper and the other just in front of and below the dorsal fin). The broad tail flukes may be pale grey, blue-grey or white on the underside, and usually have a dark margin. The baleen plates (between 230-330 pairs) are characteristically white or cream in colour. Between 50 to 70 thin, ventral pleats can be counted on the throat and belly. The longest of these ends slightly anterior to the navel. Minke whales are fast moving and may swim at speeds in excess of 20 km per hour. On surfacing, the dorsal fin typically becomes visible simultaneously with the audible blow, although the blow is rarely visible even in the calmest of conditions. The surfacing and blow rates of minke whales tend to be less regular than those of the larger baleen whales and may also be affected by the presence of vessels, the time of day, the activity of the animal and even the environmental conditions. A typical dive sequence is 3 to 5 blows at intervals between 15 seconds to 1 minute, followed by a dive lasting from 2 to 4 minutes; although minkes have been recorded underwater for 20 minutes or longer. 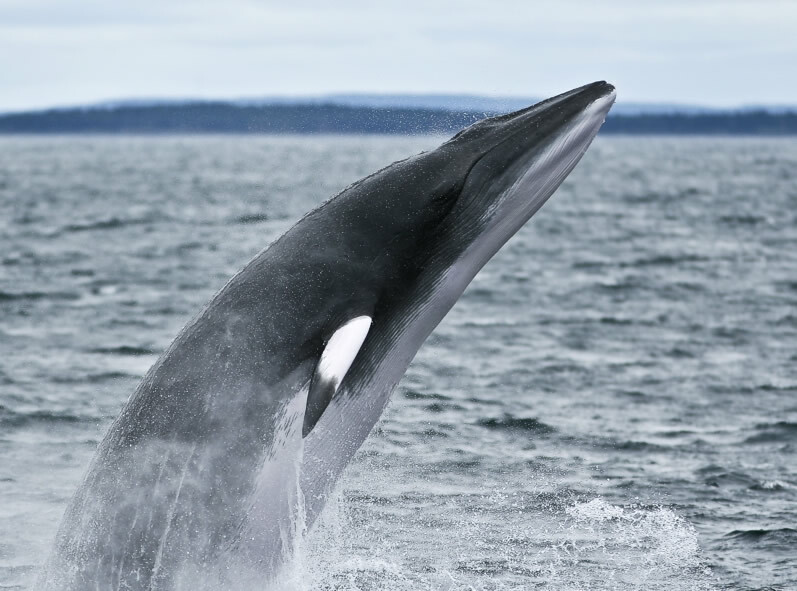 During the dive, minke whales typically arch their tail stock but never "fluke-up". They are also known to breach more often than other baleen whales, leaping clear of the surface and re-entering the water head-first or with a body splash. Minkes are distributed from the tropics to the ice edges. Like other balaenopterids, however, they tend to be found in equatorial waters during the winter and in polar waters in summer, although the species seems to be widely distributed in all seasons and migrates in a manner hard to predict from year to year. Whilst there is little direct evidence to demonstrate long distance migration, seasonal variation in abundance and distribution suggests that the species probably undergoes some migration from higher latitudes in summer to lower latitudes in the winter. Pregnant females seem to move farther north during the summer than lactating and immature females, but in some temperate waters these animals are present year round. The species is frequently seen in inshore northern and western coastal waters of the UK, and occasional records have been reported from the channel coast of mainland Europe, the Mediterranean, and the Azores and Portugal. At least 3 geographically-isolated minke whale populations are recognised in the North Pacific, North Atlantic and the Southern Hemisphere at this time. Females on average reach a length of 9 metres, and the average length of males is 8.5 m and up to 12 tonnes in weight. Males in the North Pacific reach sexual maturity at about 6.9 m in length and females 7.3 m at ages of 5 to 8 and 6 to 8 years respectively (based on growth years in ear plug cores). Breeding may occur throughout the year, but there seems to be a calving peak in winter. The gestation period is thought to be about 10 months and lactation probably occurs for 3-6 months. The new born calf is only about 2.6m long.at birth and may stay with its mother for up to two years. The natural life span of minke whales is some 60 years. Minkes tend to feed on whatever food source is most abundant in a given area, primarily krill and small schooling fish, but occasionally larger fish such as mature Arctic cod and haddock. They have comparatively short baleen and an expanding buccal cavity (with ventral pleats) which allows them to engulf a large mouthful of water and prey as the whale swims forward with its mouth open. The mouth is then closed and water expelled through the baleen plates leaving the prey in the mouth to be swallowed. Feeding minke whales are often seen near the surface chasing fish. The species has been reported to feed in one of two ways: either active lunge feeding, or passive ‘bird associatied’ feeding (depending mainly upon the feeding area in question). Most individuals seem to specialise in just one of these methods. Bird-associated foraging exploits the concentration of bait fish below flocks of feeding gulls and auks, while lunge feeding consists of the whale actively concentrating the prey against the air/water interface with no feeding birds involved. The minke whale is often seen turning on its side when lunge feeding. Minke whales are generally solitary or seen in pairs or threes. They are sometimes found in larger groups in higher latitudes in both the Northern and Southern hemispheres. In northern Scotland, aggregations can number from 10 to 15 individuals. They are more likely to be seen closely than other rorquals, as they often approach boats, especially stationary vessels, and are notorious for their naturally inquisitive behaviour. Data from studies of minke whales in the Northern Hemisphere suggests that both sexual and age segregation occurs during the summer, with males migrating further north in open seas, females remaining in more southern and coastal waters, and immature whales remaining slightly further south. In the Antarctic, larger and older animals (large males and pregnant females) range farther south to the ice edge than smaller animals (non-pregnant females, calves and immature whales) which remain in waters between about 50 degrees south and 20 degrees south. On the Antarctic whaling grounds, sexual segregation has been reported, at least temporally, with mature females arriving later in the season than mature males.